Yes. 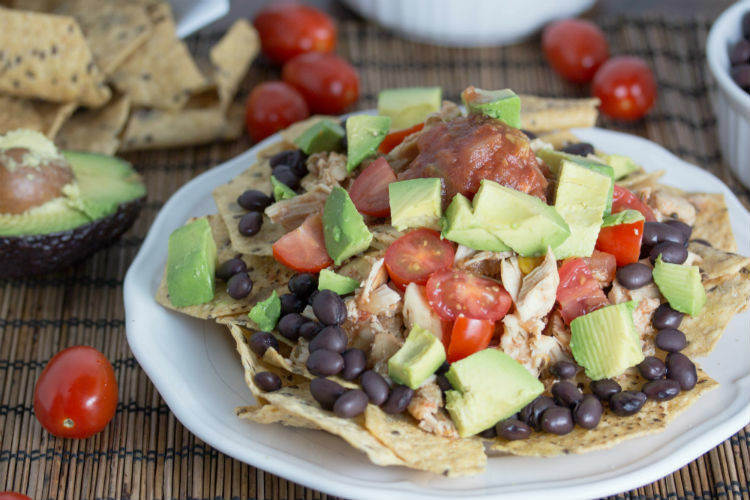 I realize these healthy nachos are missing a fundamental ingredient… cheese. However, just because your eyes are missing it doesn’t mean your mouth will. 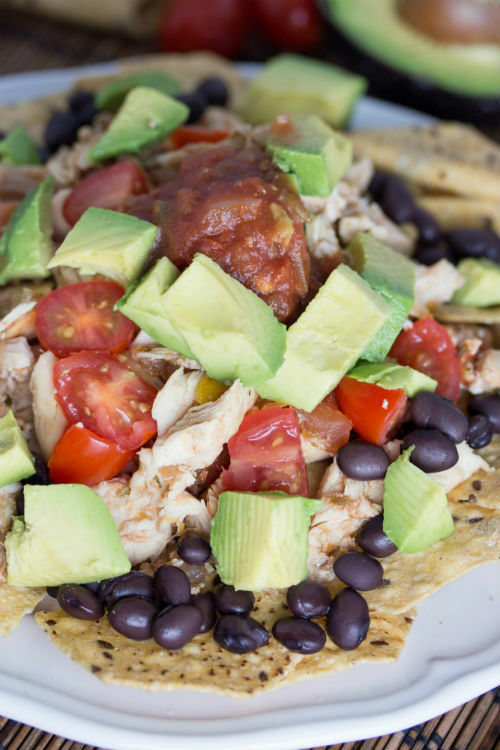 The juicy chicken, soft avocado, cherry tomatoes, and black beans combined with crunchy tortilla chips will make you wonder why we even add cheese to begin with! Do you remember me sharing my sad, sad story about getting migraines from dairy in my 3 ingredient ice cream post? Well, there’s nothing that makes you take a good look at life like ripping away one of your favorite food groups. However, let’s be honest. Us Americans eat WAY too much dairy. We throw butter, cheese, and milk in everything. It’s the American way. 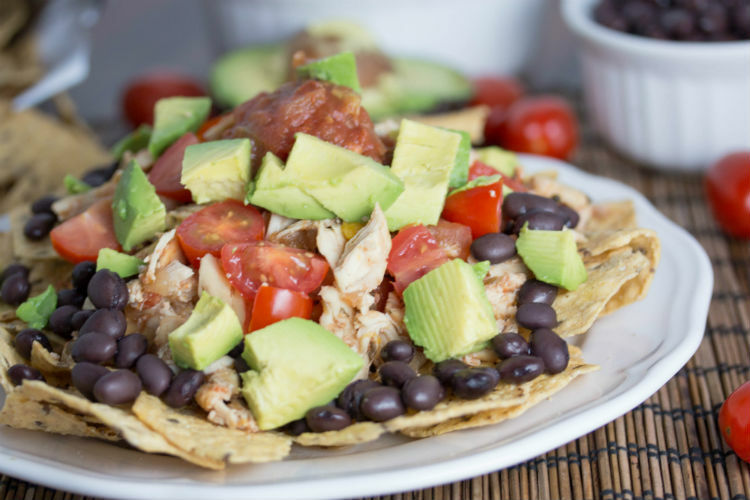 Let me grab your hand and walk you in a healthier direction… like straight towards these cheese-less healthy nachos. Come on. I know you want to ask. What’s my source of calcium if I don’t eat dairy? I’m pretty sure my mother has lost sleep over this very question. Since I’m the one cookin’, my family is mostly dairy-free now. My husband cannot abandon his lifelong relationship with cheese though. It’s just too painful to say good-bye. Since I love my family and their bones, I have found several ways to make sure we have plenty of calcium. First, I’m the daily vitamin tyrant. You know the crazy wife in pajamas running down the street with no shoes or makeup on? It was probably me running after my husband trying to catch him before he left without his vitamin. If somehow I forget, my 3 year is on it. She asks for her vitamin at least 3 times daily. I really like the Rainbow Light brand since they’re food-based with no artificial colors, flavors, or sweeteners… blah, blah, blah. They’re made of good stuff and my prenatal vitamin doesn’t make my stomach hurt! It’s the first one I can take on an empty stomach without getting sick. Here are the ones we take. Daily vitamins (love them!) but they are far from covering our daily calcium needs. I use almond and coconut milk in several recipes. Most are calcium-fortified with 50% more than dairy milk. We don’t just stop there. Did you know oranges, broccoli, kale, edamame, salmon, white beans, quinoa and chia seeds are high sources of calcium? I eat all those foods frequently, but especially chia seeds! I toss those little powerhouses in my breakfast recipes every single morning. Kami… enough with your calcium rant. 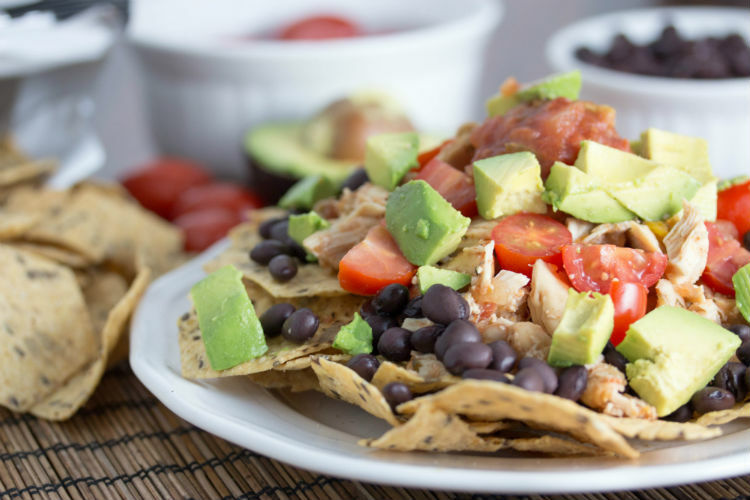 Okay, back to my healthy nachos. Have you tried Food Should Taste Good chips (insert emoji of heart bursting from pure obsession)? Heavenly! I go crazy when there’s a coupon at Costco for the big bags of Multigrain tortilla chips. I may need a private pantry just to store my FSTG stash. Are you catching my subtle hint that you should try them out? Love the taste, ingredients, and quality. 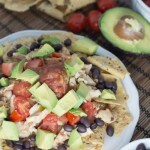 Okay, I’m really excited for you cheese lovers to set aside the cheese and try my healthy nachos. They really are delish. Enjoy, my friends! In a large slow cooker, add chicken breasts and 2 cups salsa. Cook for 6 hours on HIGH or 8 to 10 hours on LOW until chicken shreds easily. Shred chicken and allow chicken to remain soaking in juice. When serving, use a straining ladle to drain excess juice prior to scooping on tortilla chips. Arrange tortilla chips on a plate. 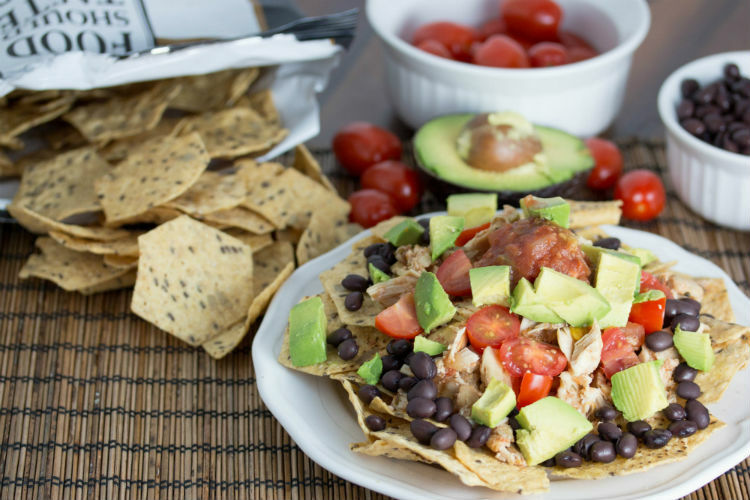 Spread shredded chicken, tomatoes, avocado, black beans, and salsa evenly over tortilla chips.